The use of lures is almost as old as angling itself, and when it comes to sea fishing, the use of feathers to take pollack, mackerel and cod goes back centuries. In recent years, however, the popularity of artificial baits has been growing amongst many sea anglers and a range of relatively new kinds are increasingly being used around our coastline. It is a list which includes a host of fascinatingly named examples – muppets, poppers, side-winders and Hokkai to mention but a few – but two in particular stand out; certainly amongst the most popular and arguably most successful, shads and pirks. Named after the small relative of the herring that it mimics in both looks and action in the water, the shad lure has long been a favourite of professional bass anglers and works equally as well on cod and pollack. At their best when fished near the bottom, from a boat in a good tide, the paddle-tailed design of the shad rides the water in a highly convincing way, making an irresistible lure for these big predatory fish, even at times when they’re not particularly hungry. Typically around 3 inches long, they are available in different materials and a range of colours to suit water conditions and the fish being sought. Soft plastic shads are some of the most successful, and many, such as the Storm Wild Eye shad offer realistic patterning, holographic foil for “flash” and sufficient built-in weight to make casting easy. Anglers and fishing equipment companies are always on the look-out for ways to make a good idea even better and the success of shads has led to a second generation version, called the side-winder, with a slightly longer, but slimmer body. Available in a whole range of colours – from natural-looking mackerel to the distinctly artificial rhubarb-and-custard – they share the shad’s stubby tail and the irresistibly life-like movement it imparts to the lure. The pirk is possibly the most unlikely lure ever devised – at least on the face of it – but there’s certainly no doubting that it works! 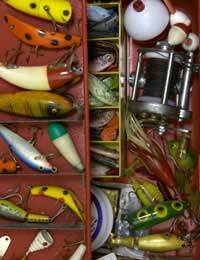 Although more life-like designs have been developed and some hybrids of pirks with other kinds of lures developed, the original version was little more than a treble hood attached to an upright length of chrome. By bobbing them up and down near to the bottom, in the cod-rich waters of the North Sea, Norwegian anglers found these odd-sounding contraptions were often one of the quickest ways to catch fish. It wasn’t long before the habit spread to Scotland, and the rest is history. One of the most effective ways to use these lures is to cast a light one uptide, allowing the boat to drift over the likely fishing ground and work the lure back as you go. Doing it this way allows the body of the pirk to stay upright pretty much all of the time; simply dropping the lure straight down over the side reduces its effectiveness, since as the boat drifts on the tide, the angle of hook to line gets steeper, making the pirk lean over too much. There is evidence to suggest that the up and down movement of the lure looks like the vertical struggle of a weakened fish to a predator, so keeping the pirk properly presented seems likely to be a big factor in how useful it will be in generating bites. Being fished at depth and routinely bounced off the bottom does have its drawbacks, however, as this lure does seem to be particularly vulnerable to snagging on undersea obstacles – but fortunately they’re not particularly expensive to buy in the first place. For a little added underwater interest, the line to the pirk can also be fitted with a muppet – a surprisingly realistic artificial squid lure – which in some waters seems to prove a useful way of catching a number of species, most particularly ling and pollack. The success of lure fishing at sea seems to depend on the clarity of water and matching the right design and colouration to the fish and the local conditions. Like most forms of angling, experience, knowing the particular stretch of water and good technique are all major factors in getting it right – coupled with the usual bit of luck, hours of practice and a whole lot of fun trying, of course! It’s certainly worth giving it a go.